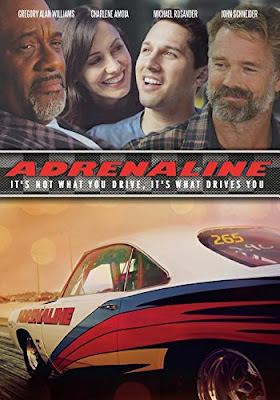 Winner of the International Christian Film Festival, Adrenalin stars Michael Rosander as Joseph Jenkins, a drag racer whose life is changed forever by a near-fatal car crash that leaves him partially paralyzed, forcing him to face new circumstances as he ultimately learns to race again. John Schneider (October Baby, Smallville) plays Paul Sharpe, Joseph’s uncle that helps his nephew find his way to race again. “After straightening the curves all these years, it was a pleasure to finally race in a straight line,” said Schneider, the beloved “Dukes of Hazard” star. “I am very excited about this film." Adrenalin will be available on Digital and DVD September 8th. For more information or to see the trailer go to www.wordfilms.com. Synopsis- A drag racer’s life is turned upside-down after a near fatal car crash, leaving him paraplegic. Joseph Jenkins (Michael Rosander), thinks his life is over, but while in the hospital, he meets Elijah Salisbury (Gregory Alan Williams), who gives him a new perspective on life and helps get him back to living. When Jason returns home, an old friend of his father’s, Paul Sharpe (John Schneider) steps in and helps him back into a race car,and teaches him how to race all over again. I am a huge John Schneider fan from way back. You can see my other John Schneider movie review here. In Adrenaline we meet Joseph Jenkins a hazel eyed cutie who is according to a friend the best street racer around. After a near fatal car wreck (terrible computerized effect and this is my last negative statement about this movie) Joseph shares a hospital room with Elijah Salisbury (like the steak). Elijah has been in and out of hospitals and helps a very angry Joe-Joe find his "new" normal. What I loved most is how all the people in Joseph's circle who changed his life for the better (except for his best friend) came into his life when his life had drastically changed. When he thought he was nothing! When he thought the life he had was over and he was worthless. These people loved him and pushed for him without a history, without a personal agenda, they were there because they wanted to be. Because they believed in Joseph! I appreciated the religious aspect as well. How none of it was shoved down the viewers throat, there was not radical message about believe in GOD. The message was more about having faith, believing and trusting in yourself and others, and learning to accept your situation because there is a reason for everything. You may not always know the reason. You may never understand it but accepting it allows you to move forward without wasting time suffering and losing out on life. AND as for John Schneider, in my opinion there wasn't enough of him but I loved him as "Uncle Paul".